Chronic affliction bows down the spirit. 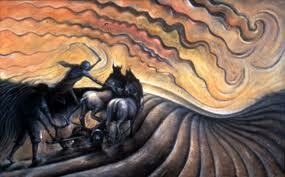 The psalmist of Psalm 129 vividly envisions his persecutors as plowmen gouging long furrows upon his bowed back. Afflicted from his youth, he refers to more than personal adversity. God’s people have been afflicted since the church’s inception. he has cut the cords of the wicked (1-4, ESV). With the phrase, “Let Israel now say,” the psalmist encourages corporate confession. That confession initially repeats his personal statement of affliction. It is as if the body of believers takes upon itself the personal pain of the psalmist. This pain has been both acute and chronic. What could be more acute than a sharp tool digging into one’s skin and peeling back the flesh? And this horrible pain became chronic because it lasted a long time. The furrows were long and slowly plowed. Some children suffer the effects of sin within the very unit that should be most secure: the family. Abusive or neglectful parents plow furrows deep and long. Whatever the source of pain, the church should help bear it. This personal and corporate confession also reminds us that the church has suffered sin’s devastating effects since its youth in the Garden of Eden. Yet the psalmist and the church confess that the plowmen have not prevailed. Our righteous God has cut the cords of the wicked. God broke the shackles that held Israel in slavery to Egypt, and he breaks the bonds that hold us in slavery to sin. Grass growing on a roof has no root system. It withers in the heat of the noon sun. It will not grow tall like prairie grass. It will never be harvested like wheat. The wicked are withering grass that will not grow or be fruitful. Their sinful efforts will never be blessed. People will walk past them without offering assistance or extending the Lord’s blessing. Thank God for the ways the plowmen have not prevailed in your life. May your church family help you bear your burdens when you are bowed down. Remember that the wicked will wither. Rejoice that Christ’s church remains strong. Even the plowmen of hell will not prevail against it!